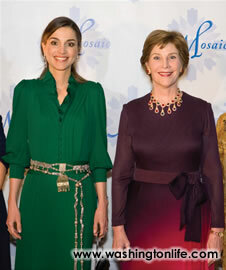 First Lady Laura Bush was there, so was Queen Rania Al-Abdullah of Jordan and all the Arab Ambassadors and their spouses. But with all the diplomatic and political notables inside the National Building Museum, it was a pair of Muppets who stole the show - beloved Elmo and Khokha from the Egyptian Sesame Street co-production, Alam Simsim. The major benefi ciary of Mosaic Foundation's Ninth Annual Benefi t Gala “Education: A Two Way Street” was Sesame Mosaic, a project designed to educate preschool children in the Arab world and the U.S. about mutual respect, and basic literacy and math. The Mosaic Foundation (www.mosaicfound. org) is an American charitable and educational organization founded and run by the spouses of Arab Ambassadors to the United States. To date, the foundation has awarded more than $8 million to organizations improving the lives of women and children globally and increasing understanding and appreciation of Arab culture in the United States. Gala Chair Luma Kawar, the wife of the Jordanian ambassador, opened the evening by elaborating on the theme “Education: A Two Way Street,” saying: “The free-flow exchange of goods and ideas depends on trust. The foundation of trust is understanding which can only be attained through communication.” Sesame Workshop, the nonprofi t educational organization behind Sesame Street and Alam Simsim, has a long history in the Arab world. In 1979, the Workshop created its fi rst production in Arabic with Iftah Ya Simsim in Kuwait. As the Sesame Mosaic Gala Chair, it has been my honor and privilege to bring together the two First Ladies who embody the hopes and dreams of Arab and American women everywhere. Lebanon has a high literacy rate, great education, equal rights for women, and great tolerance and understanding between East and West. Through Sesame Mosaic, we can continue to build on those successes. Through Mosaic and organizations such as the Kuwait-America Foundation, I hope to change the perception of Arab women, create a better understanding between the U.S. and the Arab world, and promote causes close to my heart. My hope for Sesame Mosaic is that it succeeds in each of its endeavors, which I believe to be of enormous value and importance for future generations. As Chairman of the Mosaic Foundation, I'm proud that Sesame Mosaic builds bridges of understanding between children in the Arab World and children in the U.S. while showcasing the rich heritage of our region. Working with Mosaic allowed me to work on the Telemedicine project in Morocco in conjunction with the National Children's Medical Center in Washington. Sesame Mosaic is another such worthy initiative. What makes me most proud about Mosaic is the fact that Arab ladies, spouses of Arab Ambassadors in Washington, have the vision, courage and commitment to launch such a project with far-reaching impact. The organization has since established coproductions in Jordan and Palestine. Now, with the support of the Mosaic Foundation, more Arab children will be exposed to literacy skills and the diversity of cultures thanks to the creative puppetry of the Sesame Workshop. Episodes are to be shot in Arabic with messages focusing on education and common understanding. One should only look as far as Egypt to see the positive impact Sesame Mosaic can have. In a country where over 50 percent of women are illiterate, Khokha stands as a role model for girls. One day, she wants to be a doctor. On another, she aspires to be a pilot. And on yet another day, she wants to become a librarian … inspiring a generation of Egyptian girls to do the same. I am proud that the Mosaic Foundation serves as a positive representation for Arab women; while my hope for Sesame Mosaic is simple: I hope that it will achieve peace. Mosaic Foundation has allowed me to convey a better understanding of the main traditions of the Arab world to the American public while providing needed support for developing Arab nations. The best part of my assignment in the U.S. has been working with the Mosaic Foundation to build bridges of mutual understanding and tolerance between children of diff erent cultures. Civilizations do not clash, people do, interests do. It's a lesson of history that we must relearn; a history written in the patterns and colors of the traditional embroideries that Palestinian women continue to pass on to their daughters. Khokha: You're involved in many charities focusing on women and children; why is Sesame Mosaic important? Queen Rania: Just as “America” is not a monolithic bloc, but a glorious mosaic of fi fty different states and a multitude of communities, each with their own special character, so too the Arab region encompasses a wide variety of cultures, customs, and experience. Sesame Mosaic will encourage Arab children to explore the world they inhabit - to be proud of where they come from and how much they have to offer, and to participate actively in the intercultural exchange that inspires and enriches humanity. Khokha: What impact do you think television shows about Arab children will have in the U.S.? 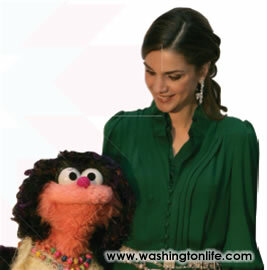 Queen Rania: It's important to learn about people different from themselves. But just as important as teaching children to appreciate each other's differences, a show like Sesame Mosaic can help reveal the many ways in which we're all the same. We all love our families. We all cherish our friends. We all have passions, hopes, and dreams - and worries too. My hope is that Sesame Mosaic, and other similarly inspired initiatives, can help all our children grow up with a genuine sense of fellowship with others around the world. During the last three years, I've been living between D.C. and London where I was pursuing a Ph.D. in Computer Science. Now, having settled in D.C., I'm excited to be a part of the Mosaic Foundation and its outreach towards children. Working with Mosaic Foundation and sending medical supplies to children's hospitals in Sudan have been the highlights of my fi ve year tenure in the U.S.
By working with Mosaic I hope to increase the understanding of Libyan society, culture and history. I also hope to raise awareness of AIDS in the Middle East and assist children that have contracted the virus. The First Lady of Qatar has been leading the effort to institute reforms for more freedom, women's empowerment and human capabilities. Mosaic Foundation is an important step towards achieving these. Front row, left to right: Morocco Amb. Aziz Mekouar; Lebanon Amb. Dr. Farid Abboud; Tunisia Amb. Mohamad Nejib Hachana; Djibouti Amb. Roble Olhaye; Oman Amb. Hunaina Al-Mughairy; Saudi Arabia Amb. HRH Prince Turki Al-Faisal; Kuwait Amb. Sheikh Salem Abdullah Al-Sabah; Libya Amb. Ali Aujali. 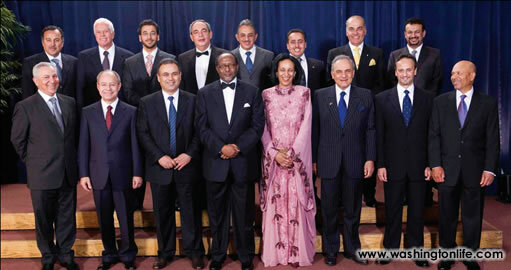 (Back row, left to right) - Egypt Amb. M. Nabil Fahmy; Arab League Amb. Hussein Hassouna; Yemen Amb. Abdulwahab Al-Hajjri; Palestine Chief Rep. Afi f Safi eh; DCM Emb. of Yemen, Abdulhakim Abdulrahman Al-Eryani; First Sec. of Emb. of Qatar, Sheikh Ali bin Jassim Al-Thani; Bahrain Amb. Dr. Naser M. Y. Al Balooshi; and First Sec. at Emb. of Oman Abdullah Suleimani.